Alicat Scientific has updated its Gas Select™ firmware for Alicat mass flow meters, mass flow controllers and pressure controllers. Gas Select 6.0 improves user control and data speed, adding features that enable users to make changes to instruments without a factory visit. 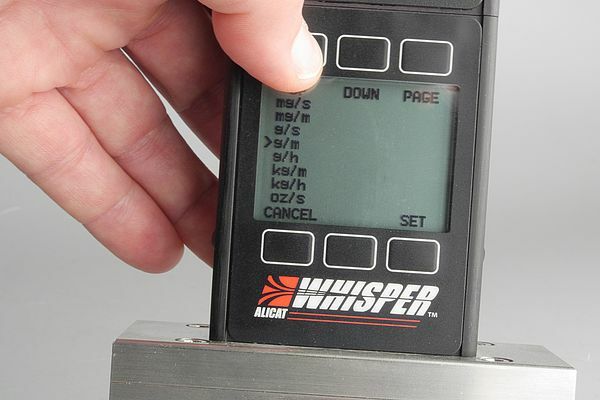 Gas Select firmware comes standard on all Alicat mass flow meters and controllers, and includes a library of up to 130 preloaded gases, referenced to NIST REFPROP 9. The firmware drives the flexible user interface for controlling instrument operation. A new feature of version 6.0 is user-selectable engineering units. Units of pressure, temperature, volume, standard volume or mass can all be changed in the field. With this capability, flow instruments can be realigned to correlate with other calculations in the process stream, or even repurposed for new applications. Also new with the update is the ability to enter real STP for operating conditions, rather than choosing from a few pre-loaded common standards. New flexibility to filter data line queries down to essential parameters results in faster, more frequent data updates. Setpoint input is now accepted either at the local panel or through the serial port, without first switching the input source. Both sources are active full time. The local panel is also easier to read, with the primary parameter that is displayed centre screen now clearly labelled. The new firmware is compatible with standard Alicat instruments-flow meters, flow controllers and pressure controllers-serial number 80,000 and higher.